EGYPT For Catholic Church, "no coup d'état took place in Egypt"
For Catholic Church, "no coup d'état took place in Egypt"
Fr Rafic Greiche talks to AsiaNews about political changes in Egypt. According to the spokesman of the Egyptian Catholic Church, the army chose to protect a peaceful revolution led by millions of young people. At present, no military took over any political office. The new interim government will take into account all of society's components, including the Muslim Brotherhood. As clashes occur in Giza, a Catholic church is attacked in Upper Egypt. 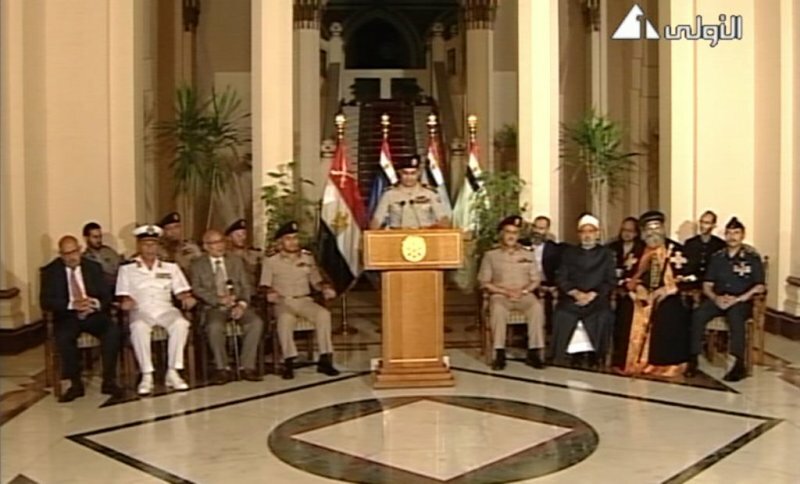 Cairo (AsiaNews) - "What is happening in Egypt is not a coup d'état. The Army chose to protect a peaceful revolution led by young Egyptians and followed by millions of people all over the country. In a normal coup, the military would immediately appointed a man as their interim president, would change the government, as it took power, but this is not the case in Egypt," said Fr Rafic Greiche. Speaking to AsiaNews, the spokesman for the Egyptian Catholic Church explained the reasons why the Catholic and Coptic Orthodox Churches backed the change in the country's leadership after three days of mass demonstrations against Islamist President Mohamed Morsi and the Muslim Brotherhood establishment. The clergyman criticised Western newspapers for attributing events to an unspecified "opposition" and for describing as a coup the decision by the Supreme Council of the Armed Forces (SCAF) led by General al-Sisi to suspend the Constitution and oust President Morsi. For Fr Greiche, "the army is non-political. It is simply managing talks between the parties. The new interim president Adli Mansour, chief justice of Egypt's Supreme Constitutional Court, is a technocrat. He promised that his temporary government would be a coalition open to all parties and components of Egyptian society." Today, police arrested 300 Muslim Brotherhood leaders, including the group's spiritual leader Mohamed Badie, its treasurer Khairat al-Shater, and five others, for inciting their followers to kill opponents of Mohamed Morsi. The call for jihad against anti-Islamist protesters has left several people dead in Giza (Cairo), where unknown gunmen fired on a crowd, seriously injuring a police officer. A Catholic church was also attacked in Minya Governorate (Upper Egypt).